Phuc received his MsC in Mechanical Engineering University of Technical Education Ho Chi Minh City, Vietnam. 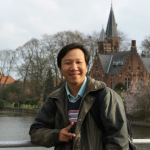 Now Phuc is a PhD student at Department of Mechanical Construction and Production, Faculty of Engineering and Architecture, Ghent University, Belgium. His current focus is on the smart structures.